As we know, Web Mercator developers made life easier for everybody by throwing away the minor radius. It’s only logical, since it doesn’t really matter what size or shape the object is as its coordinates on the map are given in degrees. Thanks to this, the same geographical coordinates can be applied to vastly different objects. 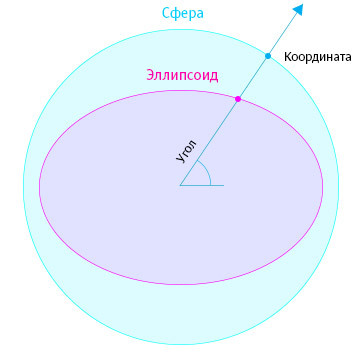 In the World Geodetic System WGS 84 our sphere, or, more precisely, the reference ellipsoid, has inverse flattening of 298,257 223 563 which means that the major radius is 6 378 137 meters and the minor radius is 6 356 752,314 245 18 meters. This means that on the Web Mercator map all coordinates are where they should be, but the sphere should be flattened by 42,769 371 509 641 1 km. Let’s compare the reference ellipsoid with a sphere. 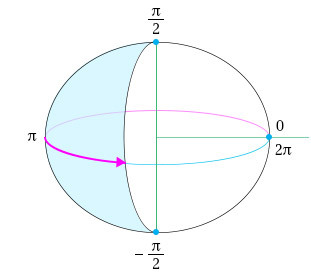 Ideally, we need to break the ellipsoid down into segments similarly to the sphere, but using integrals to calculate areas of the segments of revolution between the parallels. To avoid having to call a mathematical analysis expert, using a creative solution: drawing the ellipse in AutoCAD and calculating the areas of surfaces of revolution from one parallel to the next. We already know parallel coordinates from the previous part and as we know they will always remain the same, even if the Earth becomes cubic. This approach is very visual but still, AutoCAD returns a slightly different area of the ellipsoid — 510 065 621,655 637 km2. The ellipsoid surface formula given above tells us that AutoCAD is 0,0‪68 451 04 km2 short. Let’s try to find the missing meters. 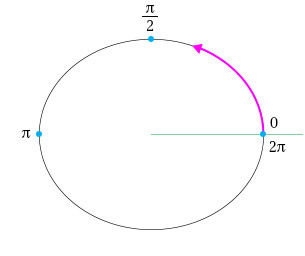 There is a segment of the ellipse between the arc vertices t1 and t2 that creates a surface of revolution whose area we will examine closer. Let’s use Mathcad for calculations. Parametric equation of ellipse x = a cos(t), y = b sin(t). 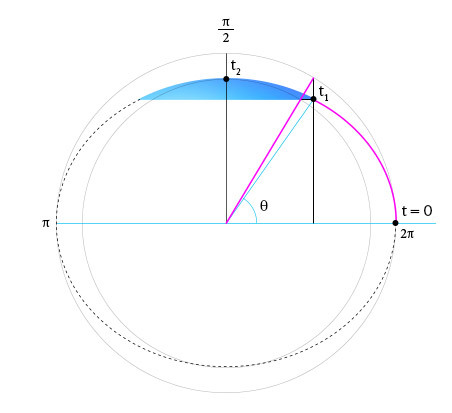 For example, to measure the perimeter of the ellipse, we can integrate sqrt(x'2 + y'2) = sqrt((a sin(t))2 + (b cos(t))2). Let’s compare it with the result produced by Ramanujan’s formula for ellipse perimeter. For an ellipse of the same eccentricity as the Earth Meridian, such a relative error is only about 4,38×10-20. For an ellipse the size of the Earth’s meridian, this would mean a ludicrous precision of 1.75 pm (pm = picometer), or about one sixtieth of the conventional diameter of an hydrogen atom (which is twice the Bohr radius)! 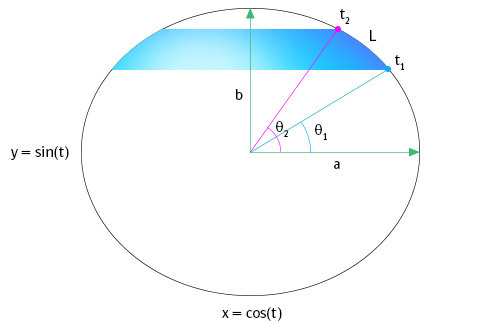 Similarly, we can integrate a cos(t) sqrt((a sin(t))2 + (b cos(t))2), to find the area of an ellipsoid. In the same manner we can calculate the area of the polar segment from t1 to the polar vertex t2. In this case, t1 = atan(a / b · tan(θ)), t2 = ½ π. Dividing the gradient scale from the equator to the polar parallel into 256 segments. Using the Sub module to calculate the area of ellipsoid segments from the equator to the polar parallel. i — counter; y — line number; θ — parallel angle; t1 — angle of the radius vector of the arc vertex; S — area of a segment, km2. Just 7 lines of code. Comparing territory areas on the sphere and the ellipsoid in square kilometers. The territory rating remained mostly the same, yet Somali, Uganda and Tuvalu moved up a place. If we look at the numbers carefully, we can see that the inverse flattening decreases territory areas gradually, the closer they are to the pole. The ellipsoid flattens the sphere unflattens the are area of the polarmost line by 0,664 411 282 512 56%.. For smaller territories (up to 1000 km2) the difference is negligible, but it becomes quite considerable for larger territories. Ultimately, if we compare the area of Yemen that the housewife was able to calculate, 454 716 km2 with its area on the sphere, 454 707 km2 and on the ellipsoid, 454 476 km2, we could say that by using the Web Mercator service for area calculation, the housewife measured the area of Yemen on a sphere. It turns out that all modern housewives actually measure everything on a sphere, but before you start pointing fingers at the geodetic services using Web Mercator, just ask any globe salesman if any of their globes have inverse flattening.